How Far is Phoenix Golf Edge? 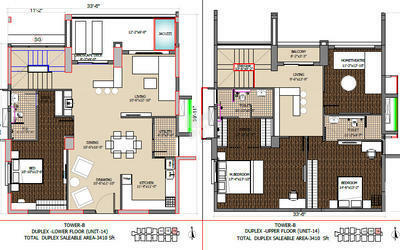 Take pleasure in what lies beyond the confines of a single storey, A Duplex with DOUBLE XL Life. Indulge in the bespoke brilliance of a duplex apartment nestled at a selected setting of Gachibowli that will caress you with its 70, 000 sqft. of splendour. This flawless rendition of comfort with surreal backdrop of a golf course is instilled within the closest proximity to your work space. 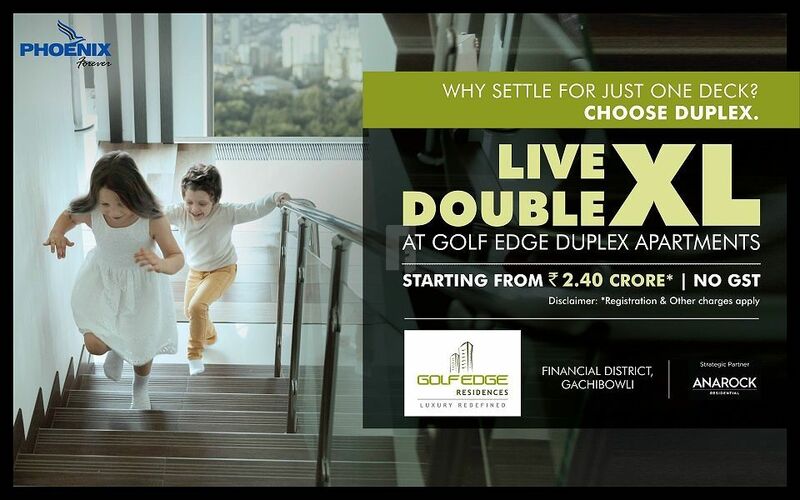 Wallow in the thoughtfully crafted duplexes at Golf Edge Residences where you need not settle for anything less than a DOUBLE XL LIFE. *Semi-Furnished: includes Ac’s, Modular Kitchen (Hob, Chimney and Dishwasher), Home automation, Geysers, False ceiling with LED lights and Fans. Table Moulded Brichs / concrete blocks. Plastered surface treated with POP punning and painted with acrylic emulsion. Sponge finished plaster and painted with weather proof cement paint. Slate stone cladding / Texture paint at designated areas. 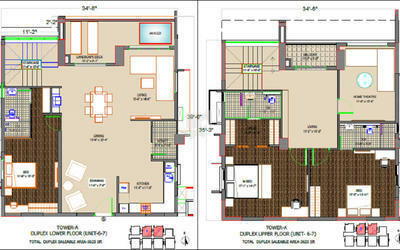 Vitrified tile flooring in Drawing, Living, Dining and Marble flooring and wooden flooring in bedrooms. 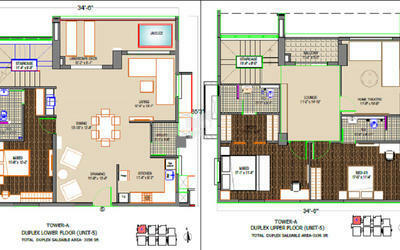 Vitrified/Ceramic Tile flooring in Toilets & designer Ceramic Tile Dadoing up to ceiling. Water proofing treatment for areas exposed to water such as toilets, balconies and terraces. Teak, wood frame, paneled shutter finished with melamine polish with good quality hardware. Teak wood frame and Flush door shutters with veneer / Laminate and fixed with good quality hardware. UPVC / aluminum folding, sliding doors with glass panel. UPVC window system / Powder coated aluminum window with glass as per design. Designed modular kitchen with polished granite platform, stainless steel sink, chimney and storage cabinet. Telephone points in all bedrooms, living, family and dining areas. Intercom connection to all the apartments from security & Club house, T.V point in all bedrooms, living room & Family room. 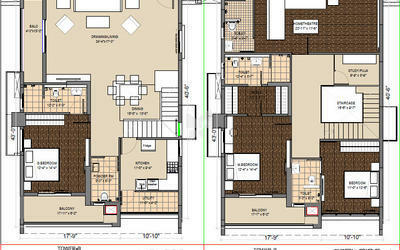 Provision for Broad band connectivity to each apartment. Imported counter top wash basins / ceramic counter wash basins in all bath rooms except maid's bathroom. Ceramic ware of superior brands and CP fittings of Toto or equivalent in toilets and kitchen. Water supply piping Superior quality CPVC piping. SS and toughened glass Railing for Staircase(Duplex) and Balconies. MS powder coated Railing for all external and service Staircase. Cement based tiles in Car Porch/Patios/drive ways. Landscaped as per architect's design. Fully air conditioned with premium brands for all rooms except Toilets and Kitchen.